This Spring Cleaning was more of a "redecorate" and I'm so very pleased my cousin wanted to come help me accomplish it! She is much better than I am at home improvement projects and actually did most of the work here herself with the removal of fixtures, painting, and shopping with me to find decor items. I wish I had taken a before picture! The best I can do is show you what the decor used to look like. My Mom-in-Law gave us this shower curtain and matching hangers shortly after we were married. We thought it would be great in the kids' bathroom and it was! 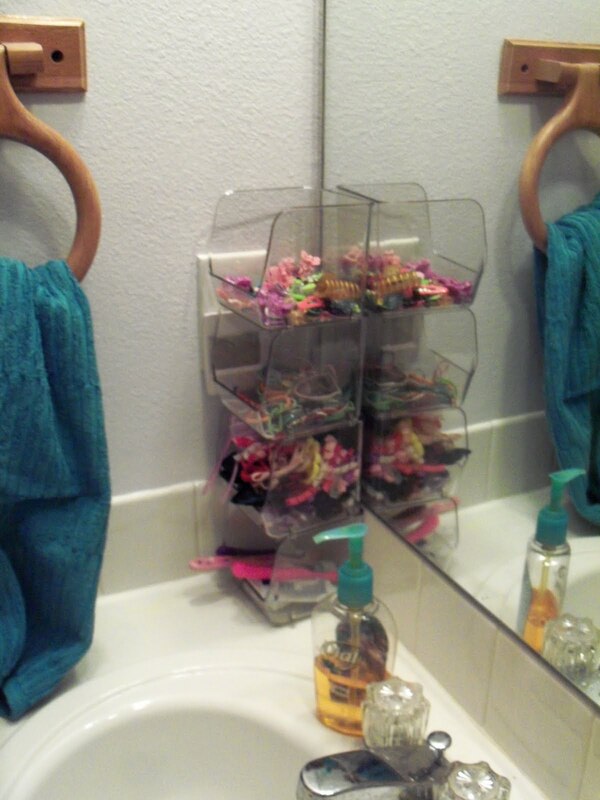 I just got tired of it also being the guest bathroom - I wanted something softer for company. 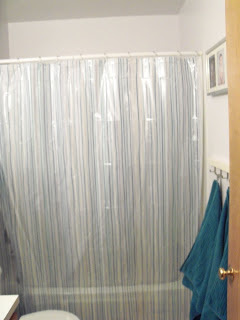 My first favorite thing: The new shower curtain was only $7. I wanted purple in it, but didn't want to spend money on towels so was delighted that the old turquoise and new purple were both in this curtain. Can you even tell the walls are purple? I got the palest shade I could find. 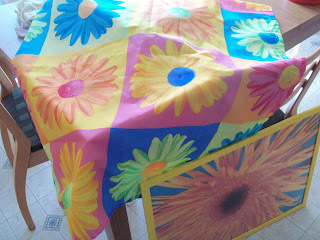 My next favorite thing: The idea my cousin gave me for wall art was great! 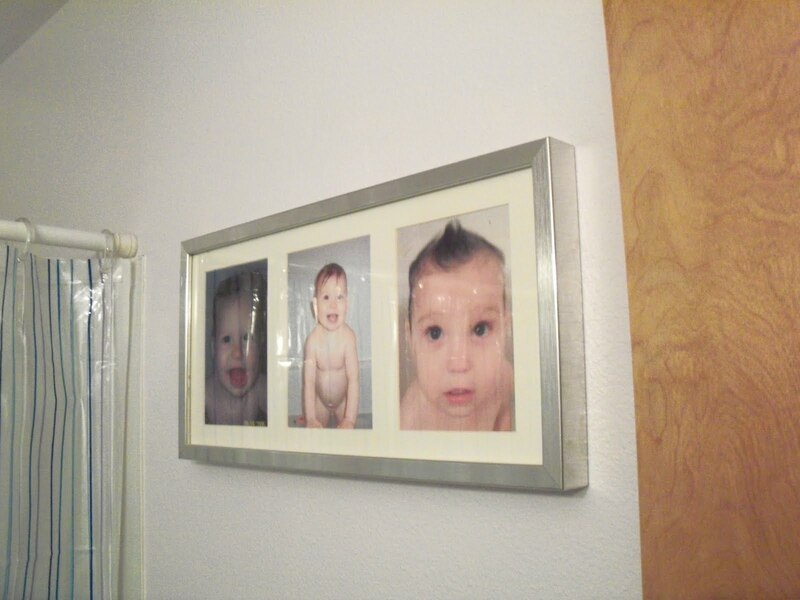 We bought a triple frame at IKEA and I put these bath pictures of the girls in it. How fun for their bathroom! For cleaning I emptied the cabinet, purged, and sorted. The walls and ceiling were all freshly painted so I didn't have to bleach anything, but I did dust the light fixture. I also picked up these stackable bins at The Container Store to keep the girls' hair stuff under control and have a place for their toothbrushes, toothpaste, and flossers which seem to always end up all over the house and subsequently, in the baby's mouth. Love the new bins. Love! I plan to totally copy the bath pictures idea for our bath. I need to get a good way to organize all the ponytail holders, clippies, headbands and barrettes too. Mine are in a shoe box and it takes forever to sort through them. Thanks! 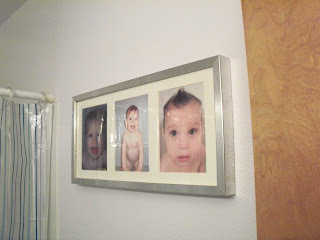 Those photos are my favorite part of the redecorating. We used a tea box from The Container Store for hair stuff for awhile and it worked well with six good-sized compartments. Can you tell I love TCS?